The Santa Monica Museum of Art currently presents Mickalene Thomas: Origin of the Universe, the first major solo museum exhibition for the New York-based multi-media artist. Best known for her elaborate paintings of African American women against the backdrop of décor recalled from her childhood, Thomas has created an all-new suite of works that examine aspects of landscape painting. She introduces a new model of trans-generational female empowerment as she explores interior and exterior environments in relation to the female figure. 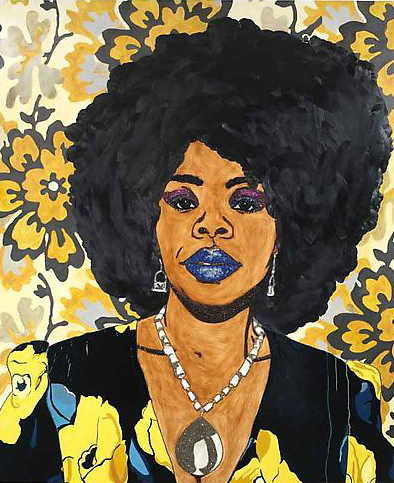 Thomas is best known for her bold enamel and acrylic paintings adorned with rhinestones, glitter, and “bling.” Her subjects seem to have stepped directly from a 1970s Blaxploitation film, yet Thomas’s influences extend far beyond. Her oeuvre stems from her long study of art history and the classical genres of portraiture, landscape, and still life. 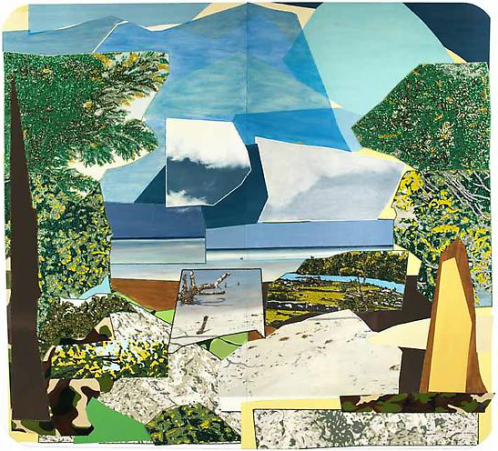 Thomas’s layered facture process begins with a photographic portrait that is translated into a collage, and ultimately reenvisioned as a painting. Her imagery comprises careful borrowings from art history and from contemporary popular culture.